ArticlesWhy is a Thermal Coating a Better Option Than Window Films and Tints ? Why is a Thermal Coating a Better Option Than Window Films and Tints ? As more and more people are choosing to ‘’go green’’ everyday, finding ways to construct eco-efficient buildings is on the rise. Whether it be to reduce your energy consumption to save money or lower your carbon footprint, every reason is good one to follow the green movement. 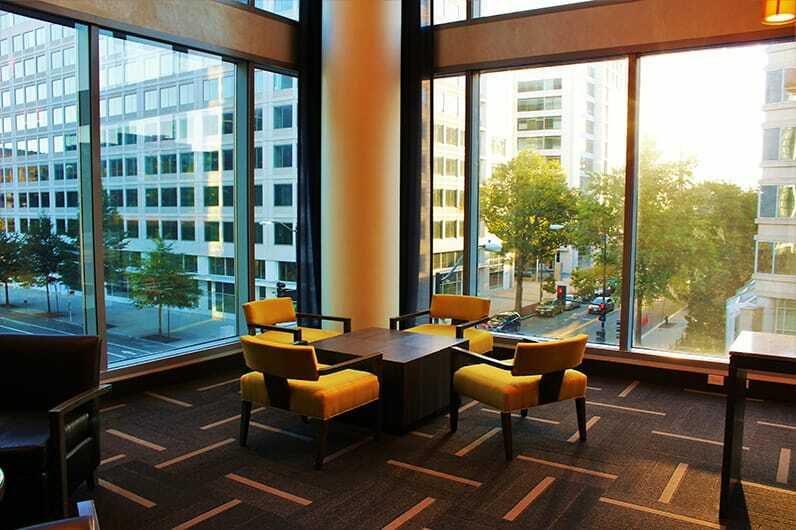 One of the best ways to do so is to improve and optimize your building’s windows. With all the options available out there – like darkening films, traditional window tints or nanotechnological thermal coatings – how can you really make the right choice? To find a solution fitting your needs, here are a few things you should consider to make an informed decision. Tinted glass is very popular among the car industry. By making the windows darker, it allows the car’s interior space to be more private. It also blocks UV rays, thereby reduces the internal temperature when it is very warm outside. However, building windows aren’t like car windows. While car windows are manufactured to accumulate a large amount of heat, regular building windows are not made to resist such an important thermal load. By applying a tint, you’ll create a more private feel to your space, but the amount of sun exposure could greatly diminish the product’s performance and even damage the glass over time. Plus, the room will heat-up very quickly and all sense of comfort will be lost. The great thing about reflective film is that it makes the UV rays bounce back from the window. By doing so, it stops them from possibly affecting your health, while reducing the impact of the outside heat on the ambient room temperature. Logically, this will help you save money on your energy bills during the warm seasons. Its biggest downfall would be the lack of natural light penetration : reflective films deprive most spaces from natural sunlight on a daily basis. Traditionally speaking, the more a window film is efficient, the more it will darken a room. For that reason, you might find yourself needing to spend more on lightning to alleviate the additional darkness – even during the day. One of the things you have to know about films is that they have life expectancy of approximately 8 years. After all this time accumulating thermal loads and being exposed to sunlight, the film will normally start to discolor, peel, dry, crack, and form bubbles. Overall, it will lose its initial effectiveness. Among the options available on the market, the thermal coating is certainly the most technologically advanced. Having recently made its way onto the Canadian market, this innovative product is a total revolution in the eco-efficient industry and the technological world. As soon as it is applied, the coating blocks 100% of UV rays. While protecting your family, colleagues and material goods from the ray’s potential harm, SketchNanoGard Thermal also minimizes the infrareds penetration – avoiding heat accumulation and thereby reducing energy bills. It also allows you to control your heat loss in the winter, thanks to the thermal barrier created. By reducing your heating needs in the winter and your A/C consumption in the summer, you will be able to save so much that you’ll benefit from a return on investment after only 3-4 years following the coating’s application. Plus, our product is made to last 20 years. Definitely a smart investment for the future. Another major SketchNanoGard Thermal virtue is that it diminishes condensation on windows by up to 50%. By avoiding drop formation, you are also avoiding dripping and related issues that could potentially lead to mold formation on walls and framing. Plus, condensation can easily become ice, resulting in diminished natural light and heat loss. It optimizes your windows without reducing natural light penetration in your rooms, allowing you to now benefit from highly efficient windows on a daily basis. In terms of eco-efficiency, it is easy to say that SketchNanoGard Thermal coating is the most technologically advanced and most efficient option out there.